I'm still referring back to this post that John K. had on his blog last week that I expanded upon in my last post. I think there's a lot of good stuff in there that I'm sort of taking on as a personal challenge to see what I can come up with based on John's ideas on character design. The little guy that I had drawn as a demonstration of simple cartoon construction in my last post is appealing enough I suppose, but his structure is limited to very basic spherical shapes: slightly distorted egg shapes for both his head and body. As I had mentioned, it was for a beginners' cartoon class, so that's why I kept it as simple to follow as I could, but it is admittedly a bit boring. My own personal taste dictates that there be more of a feeling of animation, especially the principle of "Squash and Stretch" that gives a character a more pliable and "organic" quality. On a chubby little guy like this particularly, it's good to imbue him with a feeling of loose flesh that reacts in actions and expressions. Additionally, I am trying to explore other design possibilities, which John covers as "Aesthetic", where you try to make the design more visually appealing by varying the types of lines and shapes, as well as relative lengths and widths of the many elements within the figure. So, in the case of this little guy, I tried distorting those original egg shapes, adding some straight planes and what we call 'S' curves to break up the monotony of what it had looked like before. The sketch on the righthand side of the exploratory concepts page recalled a guy I used to work with years ago named George. 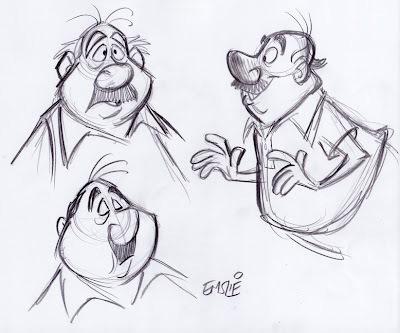 Just like the rough sketch, George always had a big easygoing smile, with an upper lip and mustache that jutted out above a lower lip that was swept back with a receding chin. He was a really funny and delightful guy, so I thought I would base my character on his personality and physical traits, though this is not meant to be a perfect likeness of him, but rather, just using George as a starting point for developing this guy in a specific direction. The veteran Disney animator, Eric Larson, often noted how he based the persona of Figaro, the kitten in "Pinocchio", on that of his own little nephew. This little kid could be stubborn and prone to temper tantrums, so Eric imbued his character with similar mannerisms, resulting in a character "type" that the audience would likely be familiar with and thus could easily relate to. This approach of basing characters on either one or a combination of several people you've actually met in your life experiences can result in richer animated performances and designs that really communicate a specific idea, rather than just trying to invent something randomly from scratch. So, in developing this character based on my old friend George, I tried to recall specific instances from when we worked together. One thing I remembered was how George used to enjoy going out for the occasional game of golf which was compliments of one of our longtime vendors in appreciation for the work thrown his way during the year. By George's own admission, he was a lousy golfer himself, but he was mostly looking forward to the free meal he'd get back at the clubhouse dining room! George was a wheeler-dealer who loved to barter for things rather than pay good money, therefore a free lunch was never turned down. Another fond recollection I have of George is his impromptu, hip-shakin' Elvis impersonations. Again, that's something colourful and fun that can be utilized in the traits of this character design. 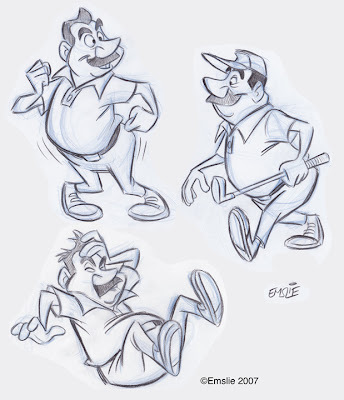 By the way, George may have had a middle aged paunch, but he was not as hefty as this character, so that is still a direct holdover from the original concept. This character could be taken further, exploring more visual possibilities before refining it into a final design, but since this is just for the sake of this demo, I'm going to leave it there. 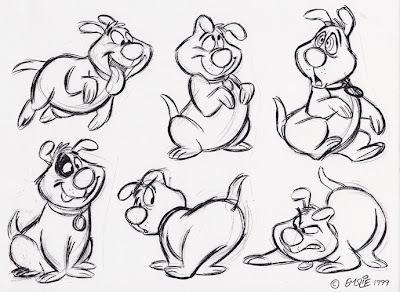 Lastly, here is a page of rough poses I did of this dumb mutt many years ago. You'll note that this pooch ended up as my life model in the cartoon heading up my last post. Fortunately, the black eye he'd likely acquired in a doggy rumble seems to have healed up nicely since the rough sketch. Hot Off The Drawing Board!